Your mascara formula should work with its mascara brush to get the lash look you love – a perfect fan of well-defined lashes. For lashes with perfect definition and volume, the best brush for the job is a flexible, sculpted brush that can separate and coat even the fine, hard-to-reach lashes. Combine that with a water-resistant formula, developed with strong pigments for deep color, plus Mary Kay® Panthenol-Pro Complex™ and vitamin E to help moisturize, strengthen and condition lashes and help defend against breakage and you’ve got the perfect recipe for lashes that say, “Look at me” in the right ways. Place brush at base of lashes and sweep up from root to tip. For longer, fuller-looking lashes, quickly reapply one or two additional coats. Mary Kay® Panthenol Pro Complex™ is an exclusive complex that contains provitamin B5 (panthenol) and phytantriol, ingredients commonly used in shampoos and conditioners that together attract moisture from the air and bind it to hair. 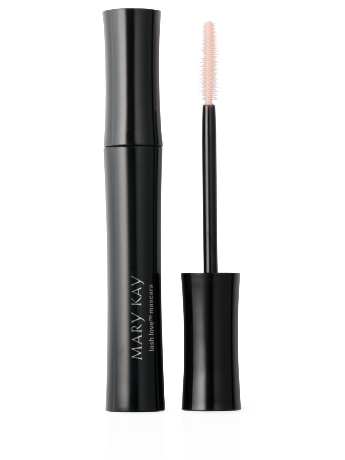 When used in mascara, this complex adds moisture to eyelashes and helps make the mascara easier to apply. Vitamin E (Tocopheryl Acetate) is an antioxidant known for its moisturizing and conditioning benefits. The brush reaches even tiny, hard-to-reach lashes and wraps them in color. It features a single, sculpted piece with short and long spokes that are perfectly aligned to separate one lash from the next. The short spokes deliver just the right amount of the formula, while the longer spokes comb it through, depositing it evenly on the lashes. Plus, it’s designed to eliminate clumping. The exclusive Mary Kay® Panthenol-Pro Complex™ includes two ingredients – pro vitamin B5 and phytantriol – which are often used together in hair care products. The formula is also enriched with vitamin E, widely recognized for its conditioning benefits. Women Everywhere Love Lash Love® Mascara! 90% said it lasted all day without flaking or smearing. 90% said lashes looked defined and felt natural, not heavy. 89% said lashes looked lifted. 85% said lashes were separated and looked multiplied. *Study conducted by an independent research company.